The 4th of July is an exciting holiday, but for special needs kids it can all be a bit too much. Think about it: fireworks are basically EXPLOSIONS! Things blowing up can be challenging for someone who is sensitive to loud noises. Also, fireworks can’t happen until nightfall, which may mean staying up late. For typical kids that may be a treat, but some special needs kids find a disruption in daily routine very upsetting. Also, barbecues and parties may bring unfamiliar and even dangerous foods to children on a special diet. Plan ahead, be prepared, and you and your special needs kid can have a great time. Planning ahead is essential. Pre-pack a bag of comfort items, medications if necessary, and any foods that fit your child’s dietary plan. Many special needs children find that earplugs or noise-reducing headphones help in loud situations. 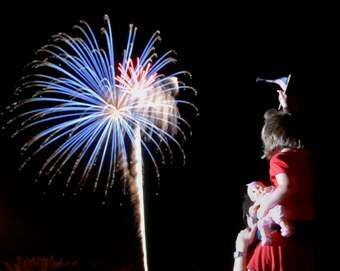 If you are going to a live fireworks display, consider a vantage point that is a bit farther away. You will encounter smaller crowds and much less noise, while being able to enjoy all the colors and patterns. We found a spot across the freeway from a show and were able to see not only that one but also several other displays in our area, without battling for parking or having to cover anyone’s little ears. Some shows even simulcast a soundtrack on a radio station so check your local listings. Speaking of local listings, another option is to watch fireworks on television or on Youtube. You might even want to do this in preparation for a live show as part of desensitization (or as theatre folk call it, rehearsal). Rehearsal is a great way to prepare for a big event, and it can be fun, too. Role play a visit to a dentist or hair salon several times with your child, and be sure to switch roles now and then! The following social story comes from National Autism Resources where you can buy many great tools, toys and other items to help on your journey with your special needs child. You can personalize this story to fit any holiday or situation. Every year we celebrate my country’s birthday on the 4th of July. We celebrate the 4th of July with fireworks. Fireworks are a fun way to celebrate. Sometimes fireworks make loud noises and have bright lights. That is OK. If the fireworks get too loud I can cover my ears with my hands or put on my ear muffs. If I don’t want to look at the bright fireworks, I can close my eyes or look away. I can watch the fireworks up in the sky or I can watch fireworks stay on the ground. If the fireworks are on the ground I will not touch them. I will let an adult light the fireworks so that I will be safe. If I am scared, I will hug my mom or dad. Hugging my mom or dad might help me feel safer. After the fireworks end, I will clap. I will be happy that I got to see the fireworks.